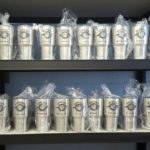 Thank you John Shirey, our loyal friend and customer for the personalized Yeti cups! Thanks! We were featured in an article in September’s issue of Our State Magazine!!! CLICK HERE TO READ THE ENTIRE ARTICLE!!! On the road with Mebane Antique Auction Gallery as they discover a vintage antique Coca-Cola Sign from a Drug Store that’s been hanging on a front porch for 35 years!